The reality is that a refund means you withheld more from paychecks or income sources than needed and provided our government with an interest free loan. The fact that so many people are accustomed to and count on a refund because it occurs year after year is where an opportunity to create better financial habits exists. There are really 3 broad categories of how money from tax refunds can be used: it can be saved, spent, or used to pay down debt. According to a study by HelloWallet (link) – an application to help individuals track their household finances – only about one-third of taxpayers save their refunds. Instead, of those who received a tax refund, their average credit card bill spiked by $2,000 in the month after receipt of a tax refund. This implies that many people are viewing tax refunds as a “license to spend” more than they otherwise would, and/or view tax refunds as “free money”. 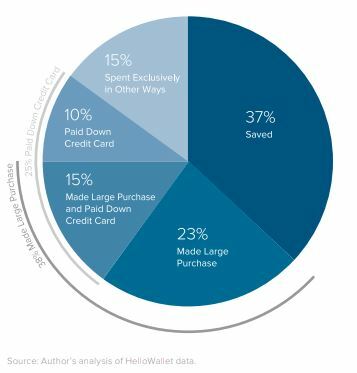 For those who view the refund as a method to payoff high interest debt (about 25% of users paid down credit card debt), that is a more financially prudent decision than frivolous spending. But, there is also strong evidence that the credit card balance would not have been accumulated in the first place if the taxpayer was withholding at a lesser rate resulting in a smaller refund. These people would be better to receive more of their paycheck and avoid accumulating high-interest debt throughout the year. All things considered, a strong argument can be made that our current tax refund pattern/system (and the way many view it) is a hindrance to Americans’ ability to achieve financial goals. The study’s observation that refunds were rapidly spent instead of saved or used to pay down credit card debt, means that many households are worse off than if they were appropriately adjusting their tax withholding throughout the year. When working with clients in our “Living Life” financial planning process, the topic of tax refunds will often arise. We advocate individuals who are accustomed to receiving a significant tax refund each year to revisit their withholding and manually adjust the amount to better reflect what is their typical full-year tax liability. For example, if one is receiving a refund each year of around $2,400, it means they could be withholding $200 less from each month’s paycheck by specifying a dollar amount rather than using standard exemptions. This approach can be more challenging for those who receive a significant portion of their compensation through variable commissions, etc. What should one do with the extra tax savings? Our most beneficial allocation ideas are to begin creating and enhancing your personal investment savings; increase your 401k withholding, or contribute to an HSA. Reducing the amount you are loaning to Uncle Sam each month can greatly enhance both your current and long-term financial health and flexibility. Posted in Personal Finance, Quarterly Newsletters.